Whether you’re a newly minted lawyer or a third year associate, a solo practitioner or one of hundreds in a national firm, you should regularly review of the basics of practicing law. Research, writing, presentation, argument, and knowledge of the law are just tools of our trade, and keeping them sharp is as important to our practice as it is for any carpenter sharpening chisels, saws, and blades. 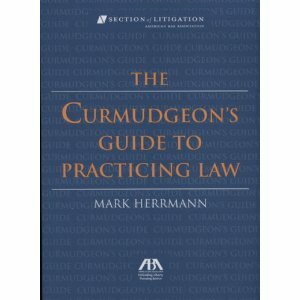 This month I am reading the short and handy “The Curmudgeon’s Guide to Practicing Law” by Mark Herrmann. With quick, practical, and to the point tips on everything from how to write a clear and concise brief to the etiquette of voice messages, it has proven, so far, to be both a delightful and refreshing reminder of the basics of legal practice, not to mention a good laugh. The Curmudgeon on Clients, wherein the Curmudgeon reminds us that we are not in the legal industry, but the service industry, and it is our job to make clients’ lives easier. Pick it up. Published by the ABA or available online at Amazon, it’s worth your read, both for the chuckles and the real, and very practical, advice for success as a lawyer. This entry was posted in Law Practice Tips, Legal Profession and tagged Books, law firm, Law Practice Tips, legal writing, Mark Herrmann. Bookmark the permalink.